I’m just going to go ahead and say what you may have already surmised based on the last chicken pictures and maybe the title of this post. Our rooster days are over. As to the how: they went the way of most unwanted adolescent roosters. As to the why: the chaos they created among our hens was absurd and I couldn’t tolerate it anymore. I wouldn’t feel the need to blog about such a morbid thing except that I posted so many pictures and comments about the crowing problem, so I couldn’t let things move on without a quick acknowledgement. We knew we were going to have to deal with them sooner or later, but didn’t know when or what we were going to tell the boys. Then things finally came to a head a week ago when I accidentally left the coop door open and the next morning the black rooster crowed directly outside our bedroom window. We dispatched them the same way farmers do. I provided the “how to” since I’ve seen it done before, and Caleb was gracious enough to preform the deed. When the boys got home from school and asked about the missing roosters we told them the truth, 100%. I was tempted to turn it into a lesson about where our food comes from, but being vegetarian makes it a bit of a moot point. The kids were considerably less concerned than we anticipated, which tells me we are doing a good job distinguishing between our pets and the animals we keep for practical purposes. 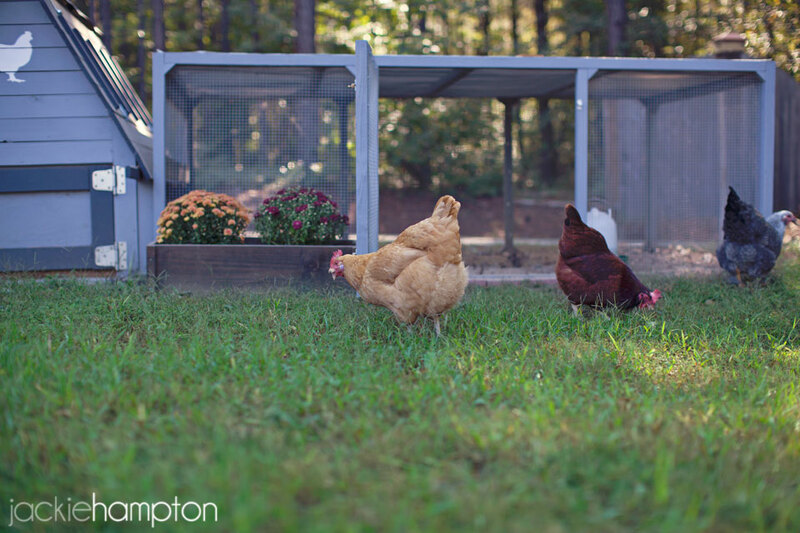 Did you know some hens cluck a special cadence right after they lay an egg? It’s believed to be a leftover behavior from the days when chickens roamed free and needed to locate the rest of the flock after tending to a nest of eggs. We only have one girl who sings the egg song and it is usually accompanied by a lot of prancing and preening so I tend to think she is showing off. Either way, it is the happiest chicken sound ever.